New Delhi : The Netherlands on Thursday reaffirmed its strong support for India’s membership of the Nuclear Suppliers’ Group (NSG) as the two countries came down heavily on the Al Qaeda, ISIS, JeM, Hizbul Mujahideen, LeT and other terror groups spreading violence in South Asia and Europe. Visiting Netherlands Prime Minister Mark Rutte held wide-ranging talks with Prime Minister Narendra Modi on Thursday afternoon on bilateral issues as well as global developments. He also signed the framework agreement on behalf of the Netherlands to join the International Solar Alliance (ISA). The two leaders shared the view that the world was rapidly transforming and was confronted with new challenges which required commitment and cooperation of all stakeholders. “Not only is there a need to ensure that globalisation is open and fair, but also for all like-minded countries to come together to tackle with issues such as poverty, hunger, job creation, energy security, human rights, gender inequality, climate change, terrorism, and the depletion of natural resources,’’ a joint statement issued by the two countries said. Sources said terrorism was one of the main issues discussed by the two PMs. They reiterated their strong condemnation of terrorism in all its forms and manifestations and affirmed that the scourge could not be justified on any grounds whatsoever. They also observed that terrorism should not be associated with any religion, creed, nationality or ethnicity. They called upon all countries to work towards rooting out terrorist safe havens and infrastructure, disrupting terrorist networks and their financing channels, and halting cross-border movement of terrorists, including foreign fighters. Both leaders also reaffirmed their commitment to strengthening disarmament and global non-proliferation efforts. 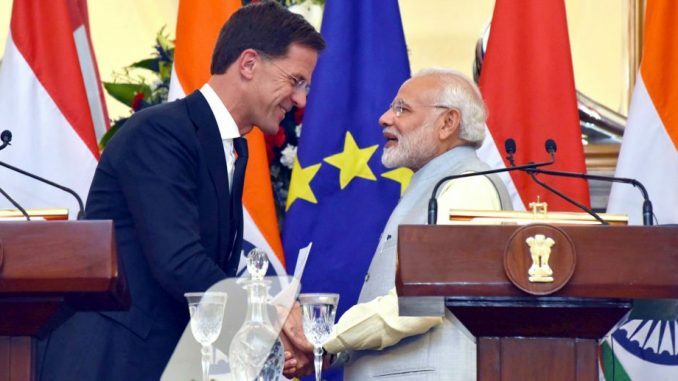 In this connection, Rutte congratulated India’s accession to the MTCR, Wassenaar Arrangement and the Australia Group. In order to further strengthen global non-proliferation, he reaffirmed his country’s strong support to building consensus among regimes’ members on the issue of India’s membership to the NSG, recognising that India’s accession would add value to the aims and objectives of these non-proliferation regimes. At a brief joint media interaction, Modi declared his government’s commitment to vigorously pursue economic reforms in the larger interest of the nation while the Dutch leader noted that the relationship between the two countries was bound to grow further in the coming years, particularly in the economic field.